I love JD Williams and the work they do fighting for visibility for the older crowd. 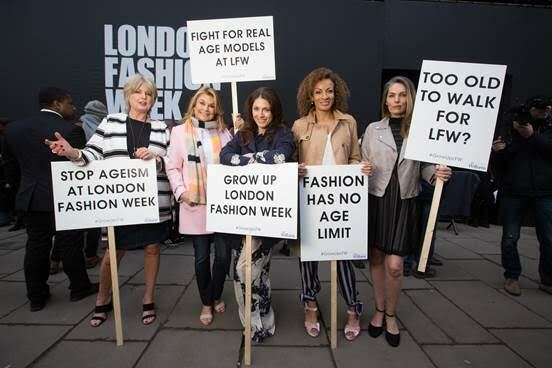 After the success of 50 Plus Fashion Week and the launch of their short movie The New F Word, this time they've made a statement at the launch of London Fashion Week, protesting against ageism and challenging it to "grow up". 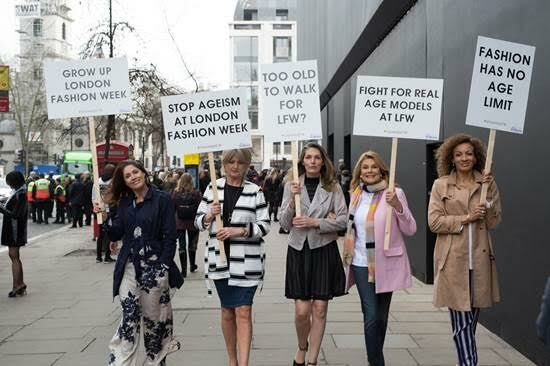 Standing outside Fashion Week's main venue on the Strand, the five models all aged 45 and over called for a wider range of ages on the catwalk where the average age is currently just 17. The models included 63 year old Jilly Johnson who commented that "Women don't suddenly stop wearing or buying clothes after their twenties, so why isn't this reflected in the models used in fashion shows?" Obviously there are a lot of areas where the face of fashion needs to be improved, with diversity still lacking amongst a sea of young, white, cis-female, able bodies. And whilst things are changing, it's not happening quickly enough with age seemingly the last taboo to have it's lid kicked off.